Returning to Lanzarote for the sixth time since the RC44 class was conceived in 2007, the final leg of the 2013 Championship Tour kicked off with season’s match racing finale in Puerto Calero. The competition was tight with just four points separating the top four teams. The race committee managed to squeeze nine flights into a squally 10-20 knots day, that saw some big names tumble off the podium. Team Aqua’s owner Chris Bake took the helm for the final match race day with Cameron Appleton calling the shifts. After a slow start to the season the team had worked their way up the leaderboard, taking a two-point advantage over Katusha going into the final event. The leaders didn’t get off to the best of starts losing their first match of the day to Peninsula Petroleum, over standing the pin end lay line at the start. 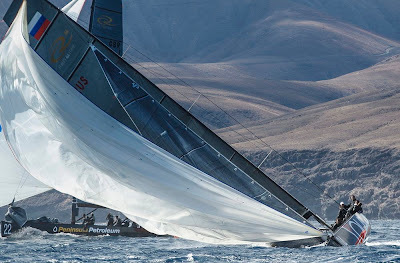 But the British flagged team pulled straight back, winning their next four races, enough to hand Team Aqua the 2013 RC44 Match Race Championship, a title they last held in 2011. Behind Team Aqua the points were tight. 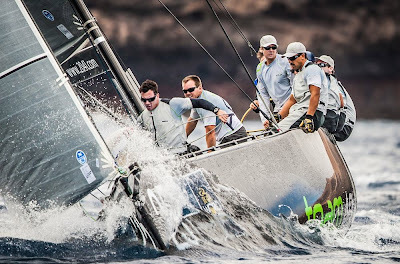 Synergy Russian Sailing Team, started the day in third place, one-point behind Katusha. 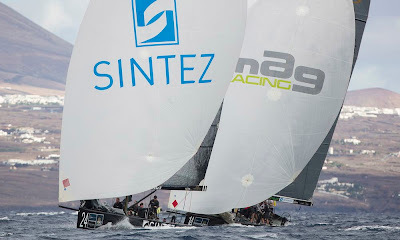 Six races sailed and six wins, including an all important victory over Katusha, moved the defending champions up to second. 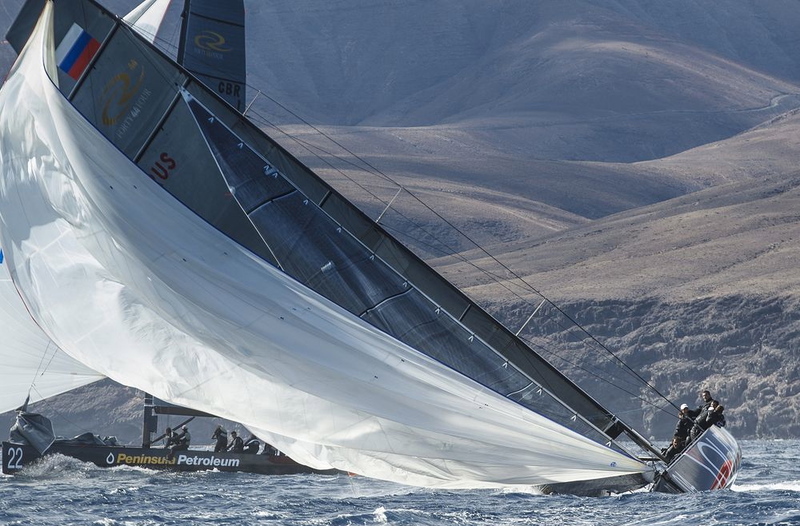 Match race helm, Ed Baird was proud of the all-Russian team’s performance against a strong international field. “Our day was fantastic the guys did a terrific job and we won all of our matches. I think it’s the best day we’ve ever had in match racing. 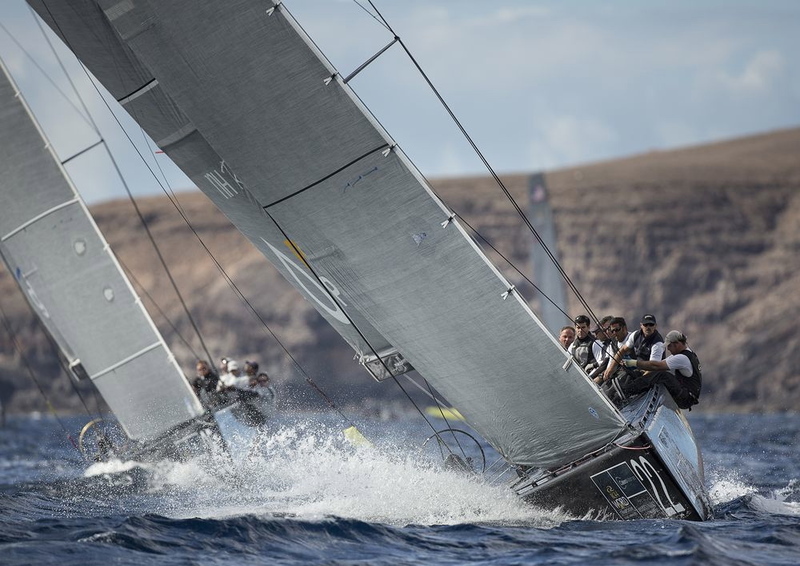 You can look back at the season and see the point where we had a little bit of bad luck but you can also see we’ve had a couple of regattas where we’ve done really well and we’re fortunate to be on the podium and in the top of this competitive fleet of boats. I’m very proud and excited for the Synergy team," Baird said. 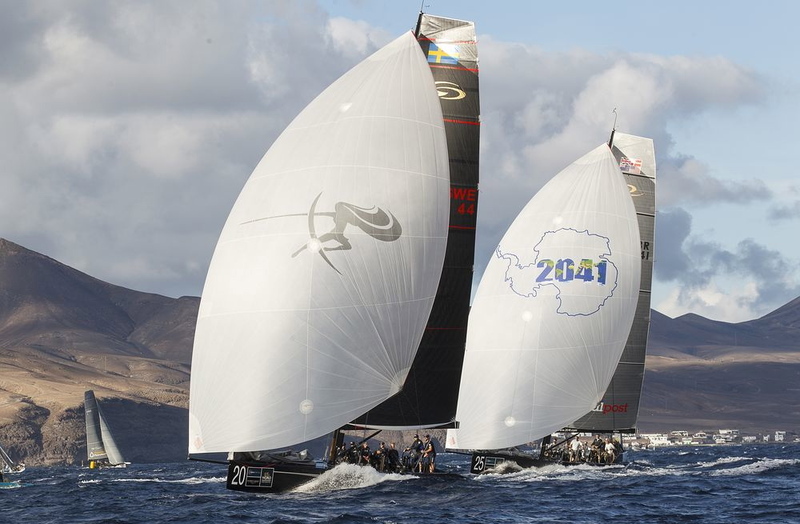 Another team enjoying the conditions in Lanzarote was Artemis Racing. With owner Torbjorn Tornqvist at the helm and double Olympic gold medallist Iain Percy calling tactics the Swedish team also won their six races, including a head to head with Team Aqua in their final race of the day. The team’s clean sheet moved them up into third place and onto the podium for the match race season. Katusha had led the match race standings for the first three events of the season, heading into the final event they still had a shot at knocking Team Aqua off the top spot. 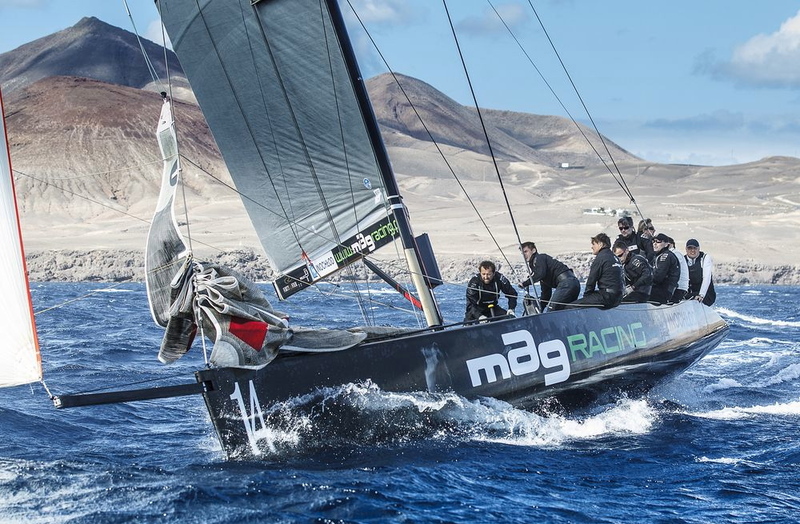 Three wins and losses in Lanzarote was not enough to keep Andy Horton and the team on the podium, finishing the season a disappointing fourth overall. 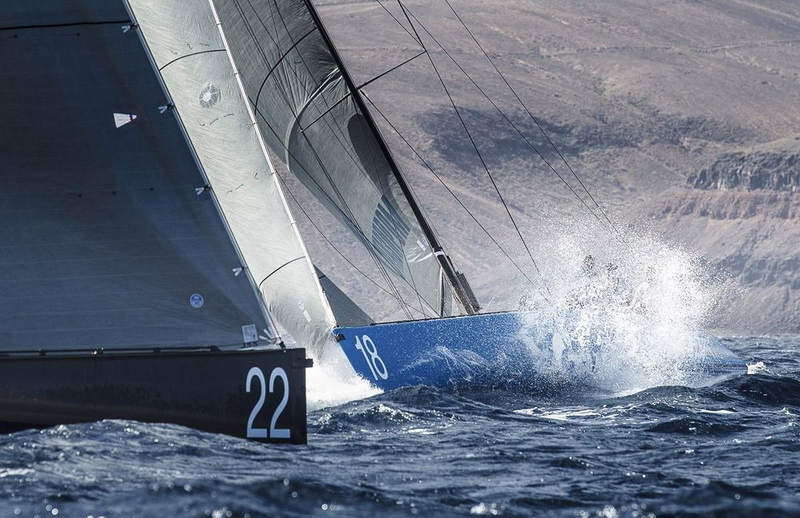 The Calero Marinas RC44 World Championships now begins. Four days of fleet racing will see the 15 teams compete for the world championship trophy, and to see who will be crowned 2013 RC44 Champions. With one title already won, Team Aqua is now looking at the treble. “There is going to be some tight competition for the worlds, it’s something that has eluded us for the last couple of years. It would certainly be nice to try and win that title, but I don’t want to get too obsessive about it and spoil our luck, I’ve just got to let it happen,” Bake said.